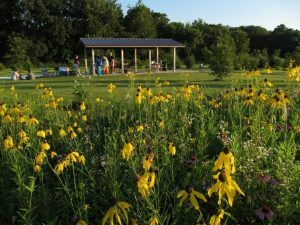 At 300 acres, this is the second largest of our county forest preserves. A playground, trails and two open air shelters border the parking lot. An easy access canoe launch enters the river at the bridge to the adjoining Kishwaukee River State Fish and Wildlife Area. Prairie plantings and row-crop fields skirt the half-mile long paved handicapped access trail, which terminates at the sedge meadow overlook deck. The sedge meadow is the largest relatively intact prairie remnant in our preserves. Many uncommon plant species thrive there, and, along with lots of other reptiles and amphibians, the rare and elusive Smooth Green Snake makes this place its home. Most of the preserve is forested floodplain, including a scenic grove of Swamp White Oak trees. Endangered mussels live in the river, and Potawatomi Woods is a destination for Smallmouth Bass fishermen. A one mile hike will get you to a bridge across Kingsbury Creek, and into the MacQueen preserve.